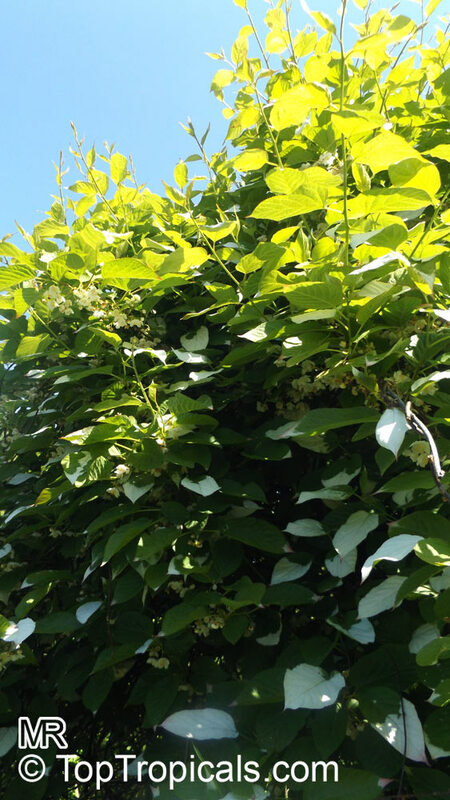 The fast-growing, climbing vine is very hardy, and is capable of surviving slow temperature drops to -34 C (-30 F), although young shoots can be vulnerable to frost in the spring. 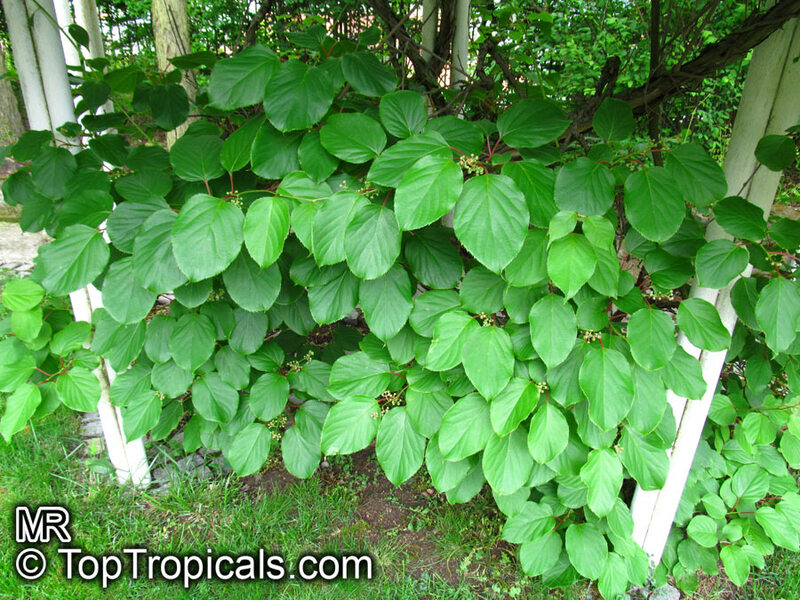 This vine needs a strong (vines are heavy) support structure on which to grow such as a trellis, arbor, patio overhead, fence or wall. 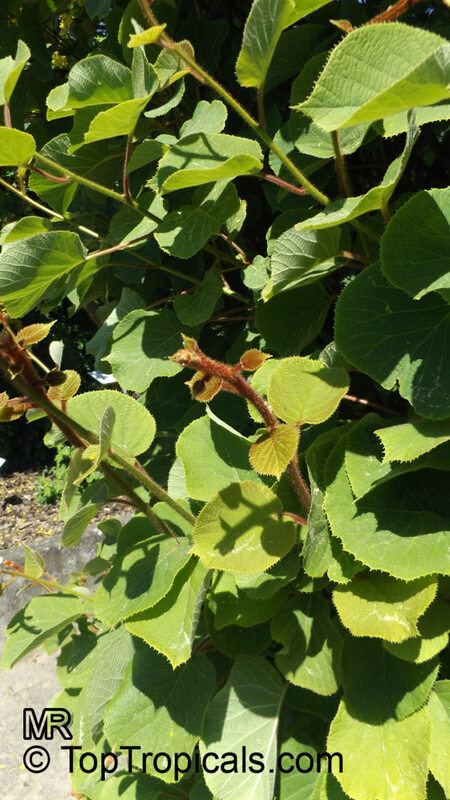 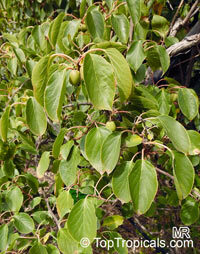 Japanese Kiwi cultivar Issai begins fruiting the second year - no pollinator needed! 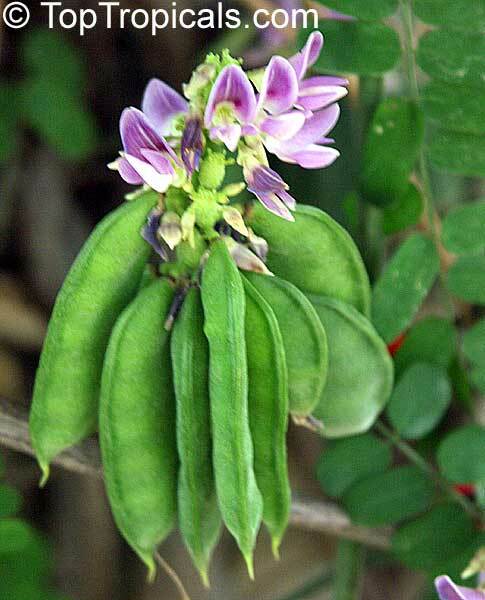 Compact enough to grow in a container. 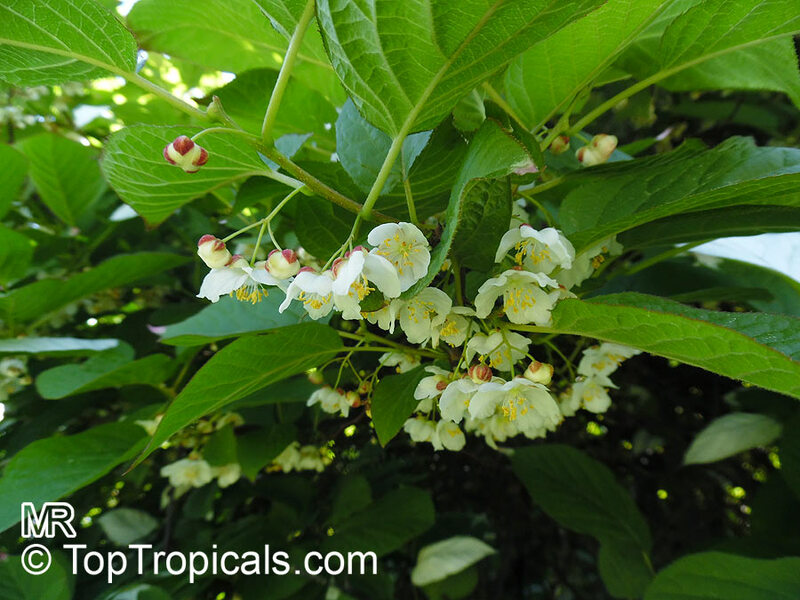 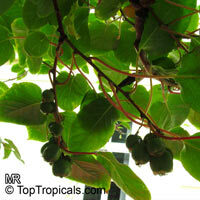 It brings the beauty and flavor of kiwifruit to your garden without the giant size. 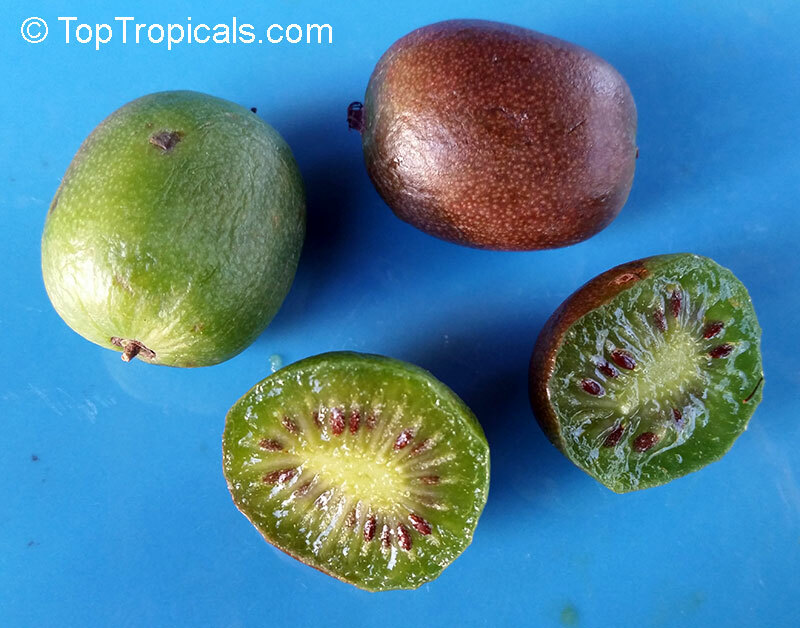 This mini-Kiwi has a restrained habit, needs no pollinator, and sets the most delicious miniature fruit. 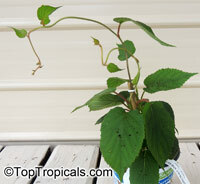 In the garden or even in containers, you will find it easy and rewarding. 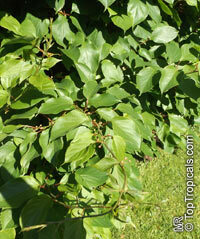 This deciduous vine is much less vigorous than other varieties - it grows easily but won't take over the garden. 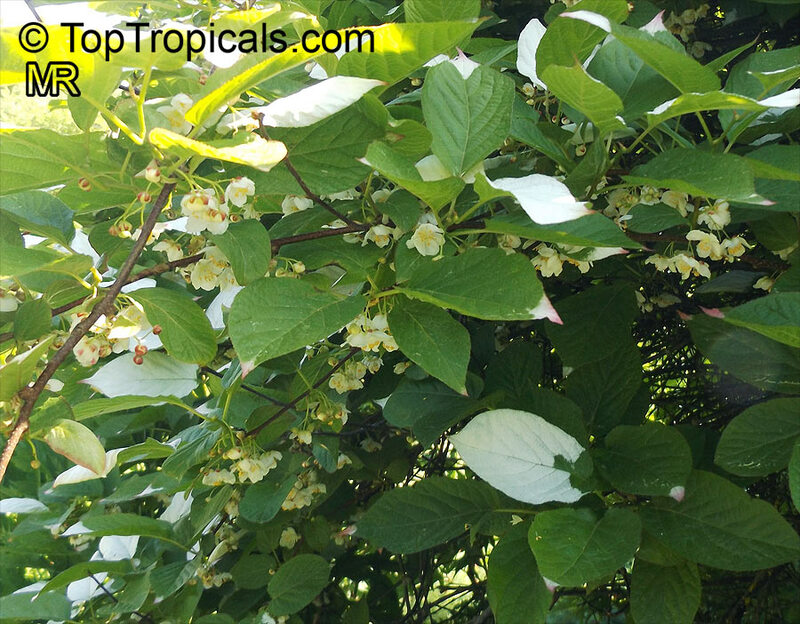 A twining climber, it offers glossy foliage, fragrant 1-inch white blooms in early summer, and a generous harvest of 1- to 1 3/4-inch fruit in mid-fall. 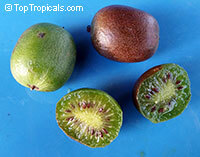 Issai has a really remarkable flavor, much sweeter and more succulent than the fuzzy kiwis found in most stores. 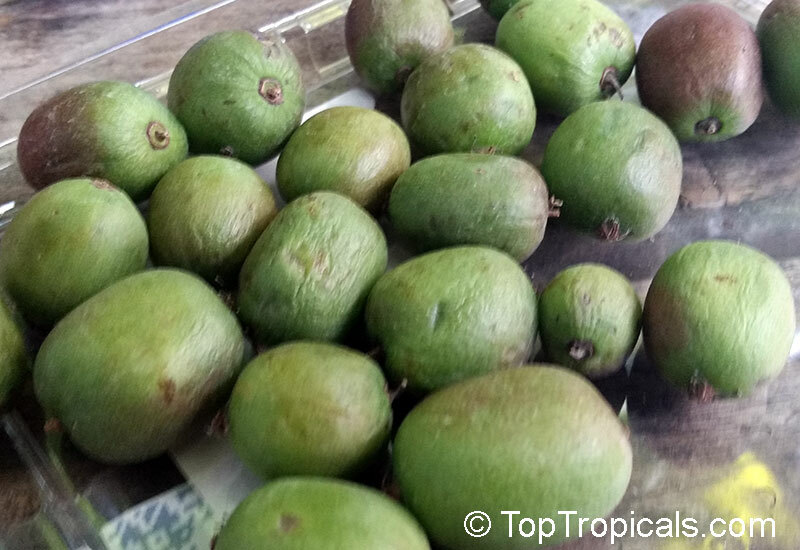 The fruit is smooth, green, and just a little soft when fully ripe. Best of all, Issai is self-fertile, so you need plant only one. 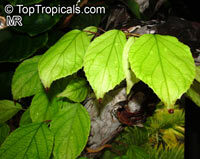 It thrives in full sun to partial shade, and prefers good soil on the acidic side. 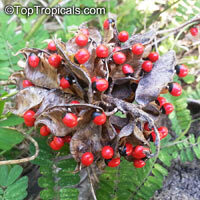 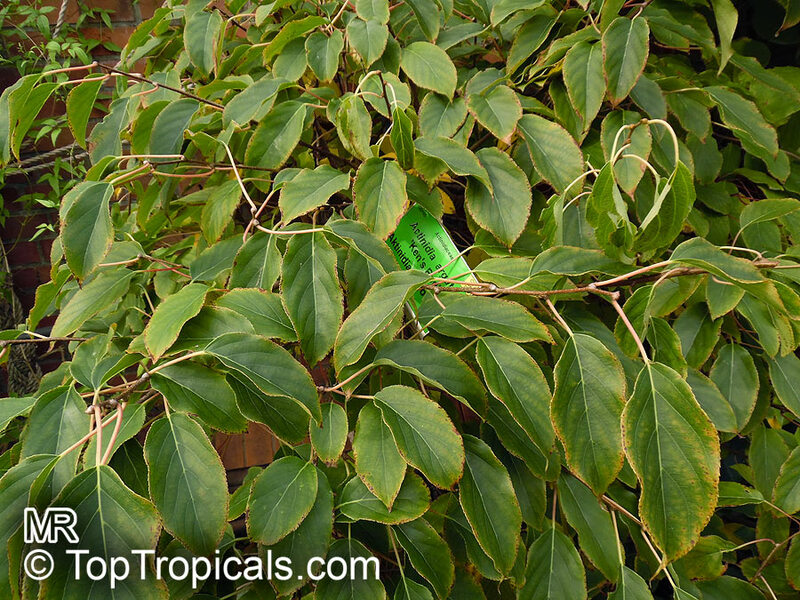 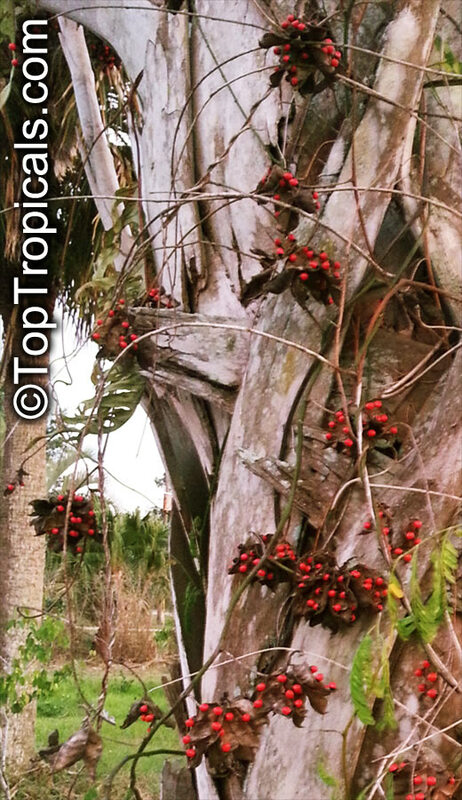 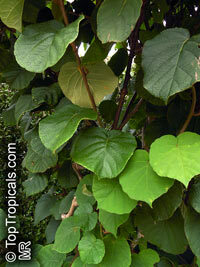 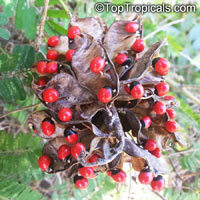 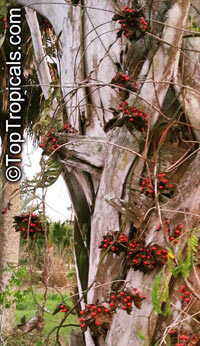 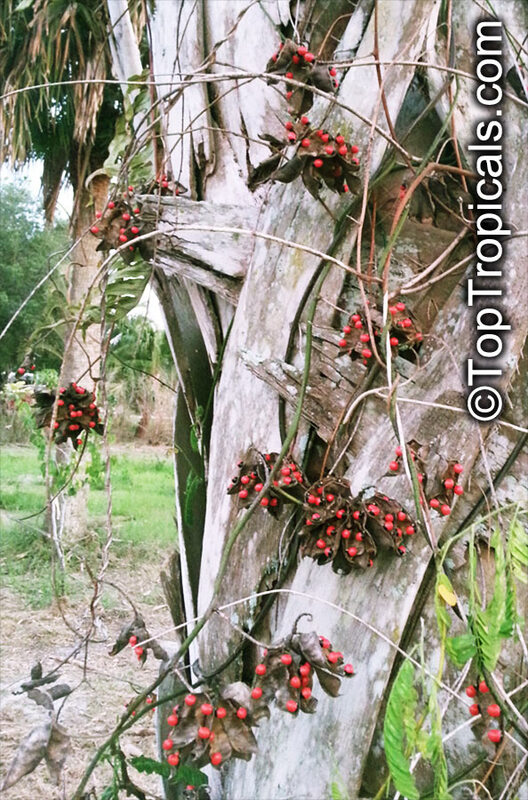 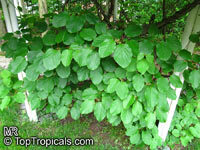 Do not fertilize this vine too heavily; this can trigger lush foliage growth but poor flowering and fruiting. 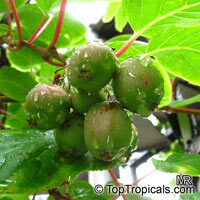 It fruits somewhat late, making it a great choice for southern climates as well. 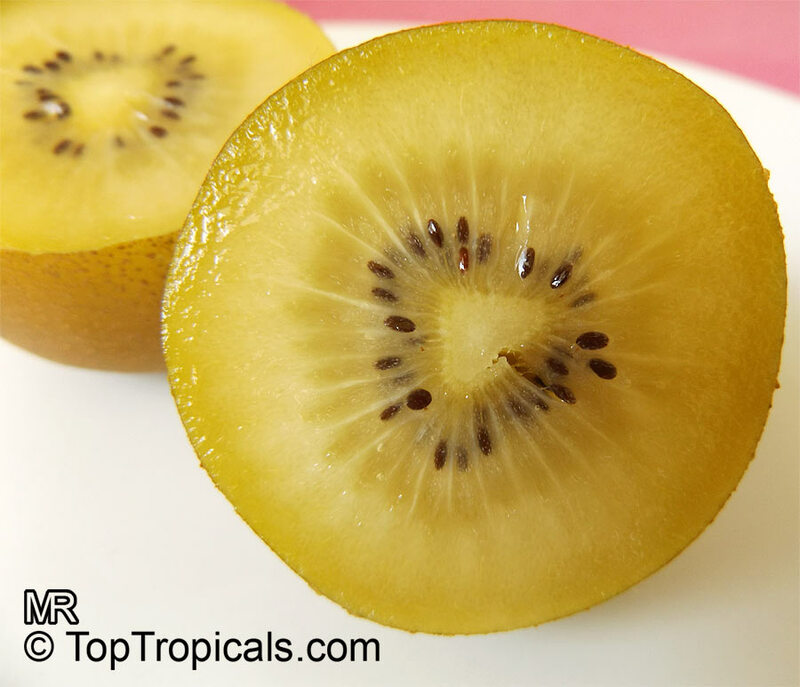 You simply cannot go wrong with this delightful mini Kiwi! 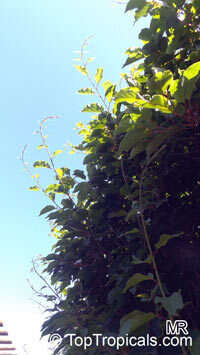 Zones 4-9. 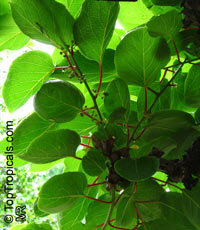 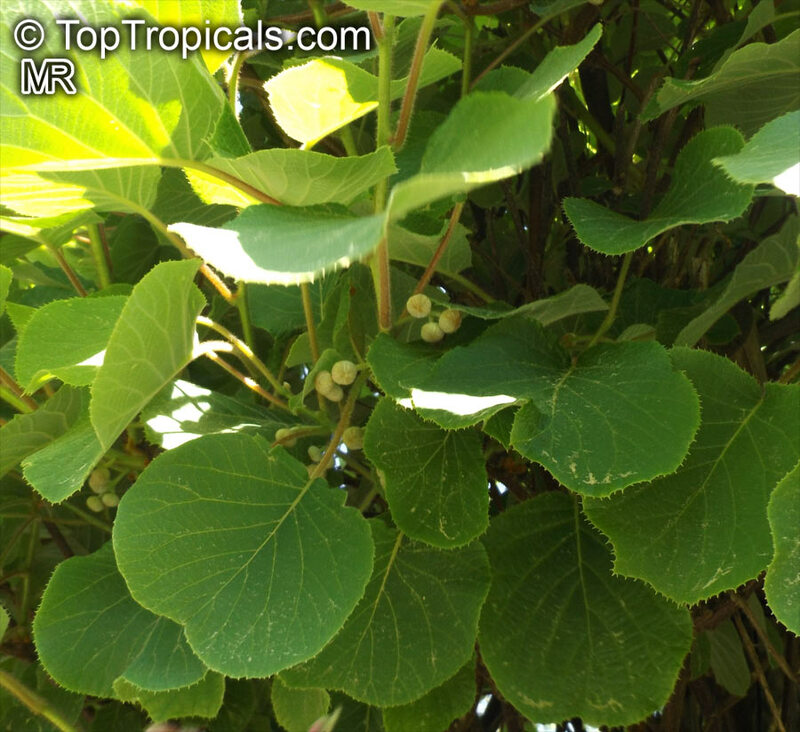 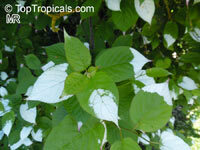 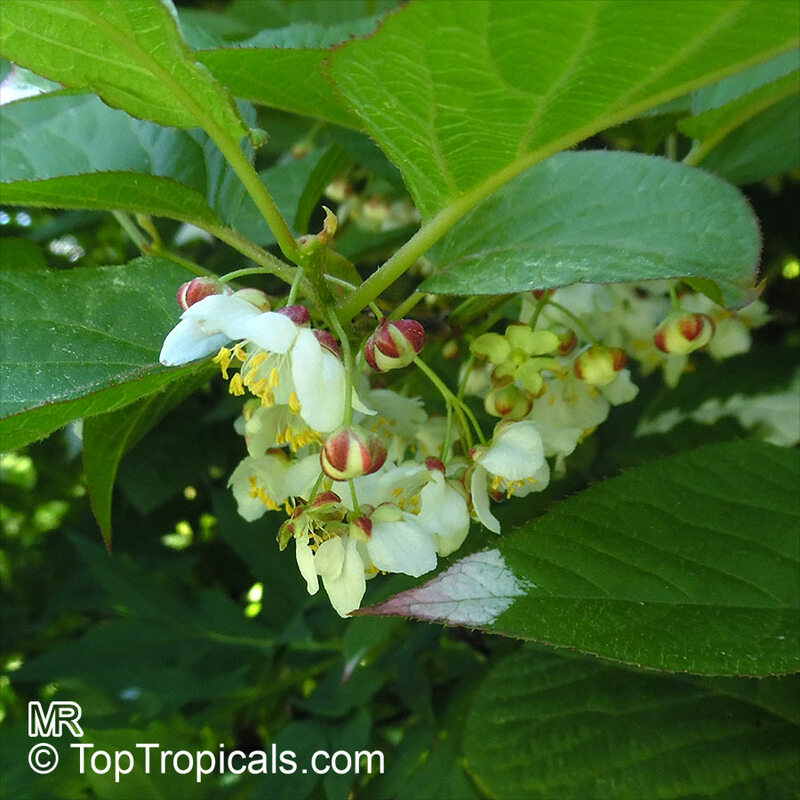 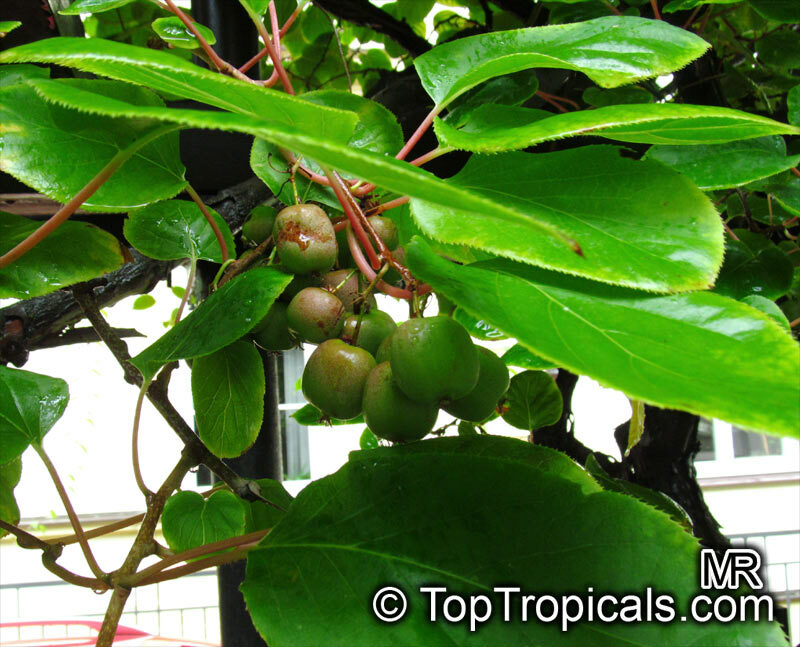 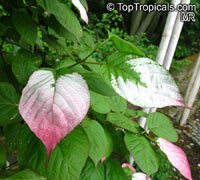 It is closely related to Actinidia deliciosa. 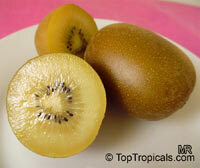 Kiwifruit is native to southern China, and has been declared the national fruit of that country. 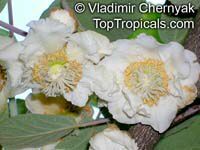 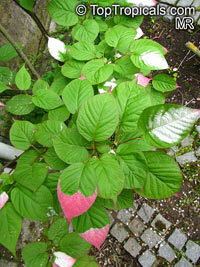 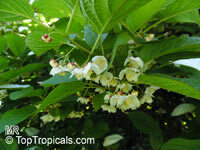 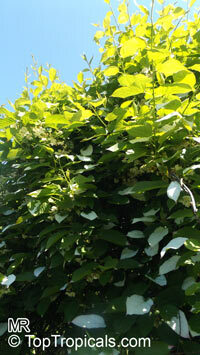 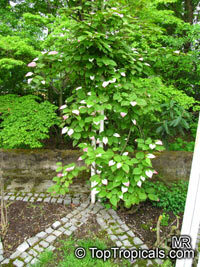 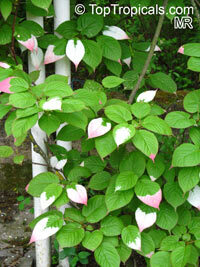 Other species of Actinidia are also found in China and range east to Japan and north into southeastern Siberia. 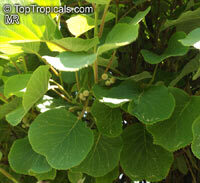 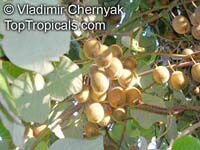 The true Chinese gooseberry (A. sinensis) is native to China. 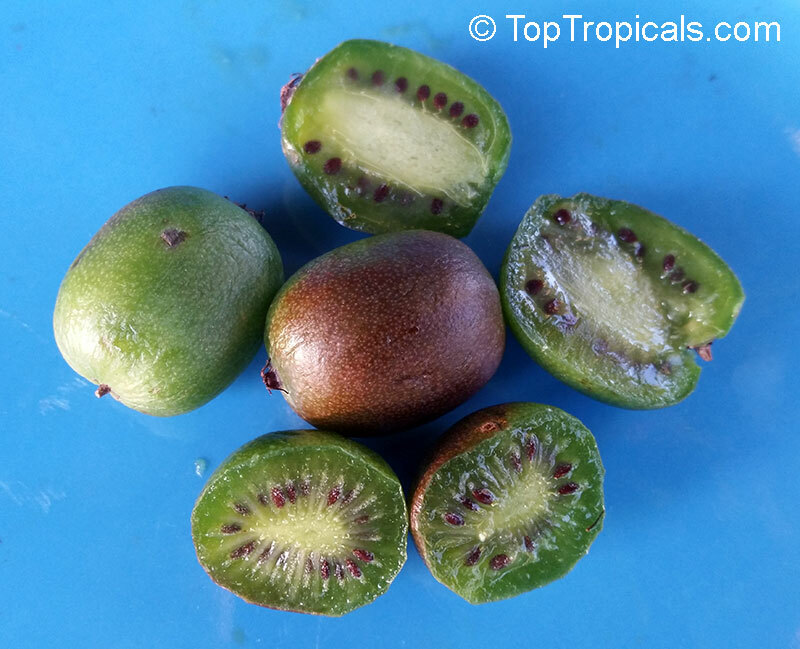 Almost all kiwifruit in commerce belong to a few cultivars of Actinidia deliciosa, and those fruit that we find at local markets is grown in New Zealand. This name "kiwifruit" comes from the kiwi — a brown flightless bird and New Zealand's national symbol, and also a colloquial name for the New Zealand people. 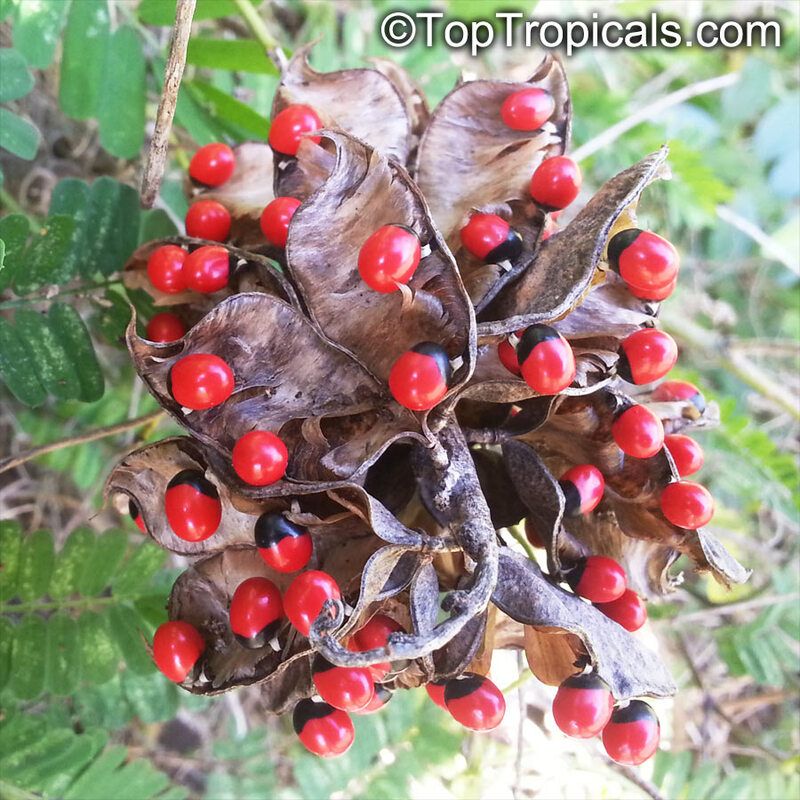 The oblong fruits are up to 3" long. The russet-brown skin of the fruits is densely covered with short, stiff brown hairs. The flesh is firm until fully ripen; it is glistening, juicy and luscious. The color of the flesh is bright-green, or sometimes yellow, brownish or off-white, except for the white, succulent center from which radiate many fine, pale lines. 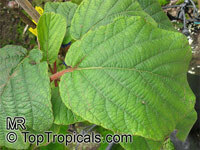 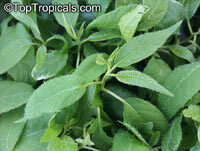 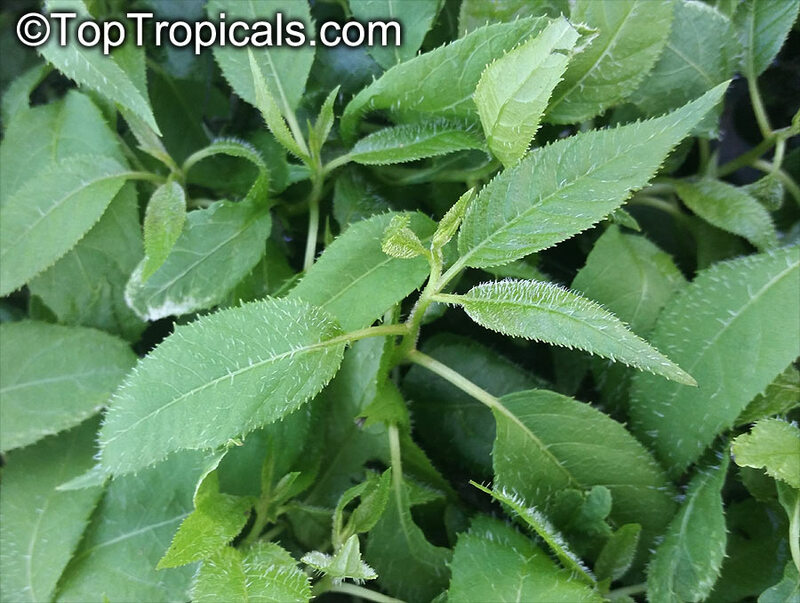 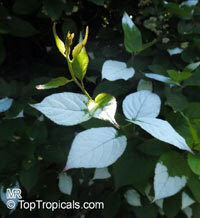 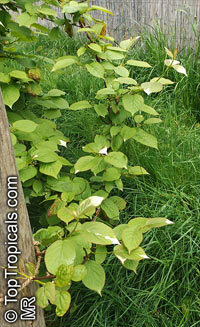 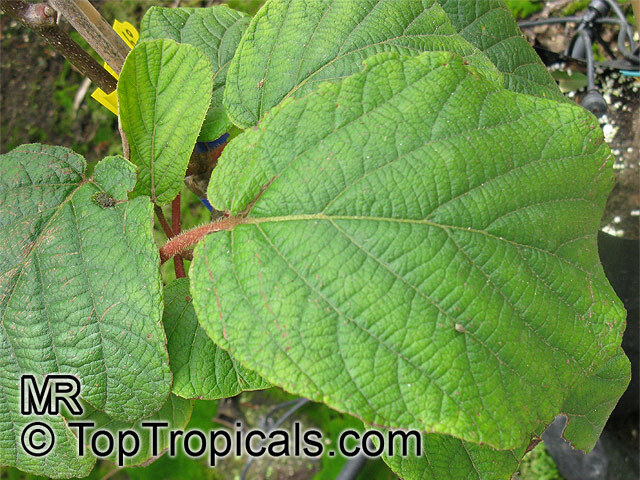 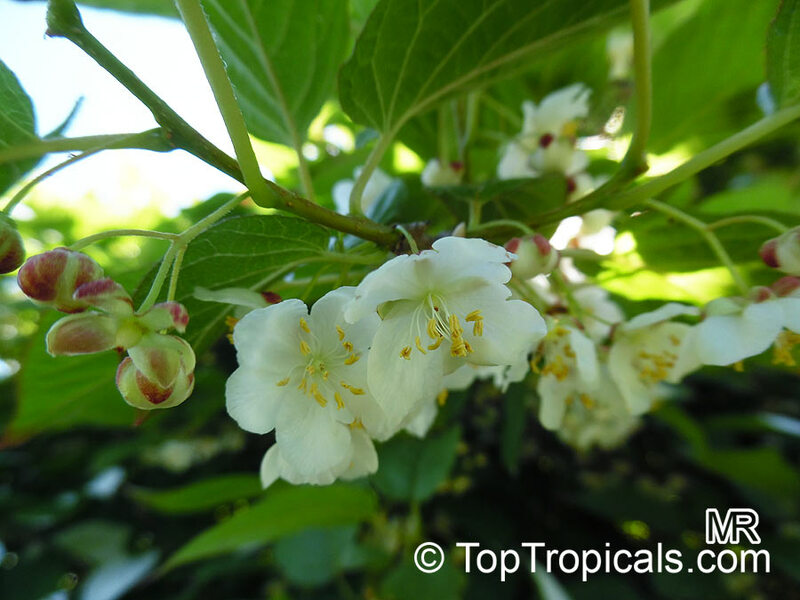 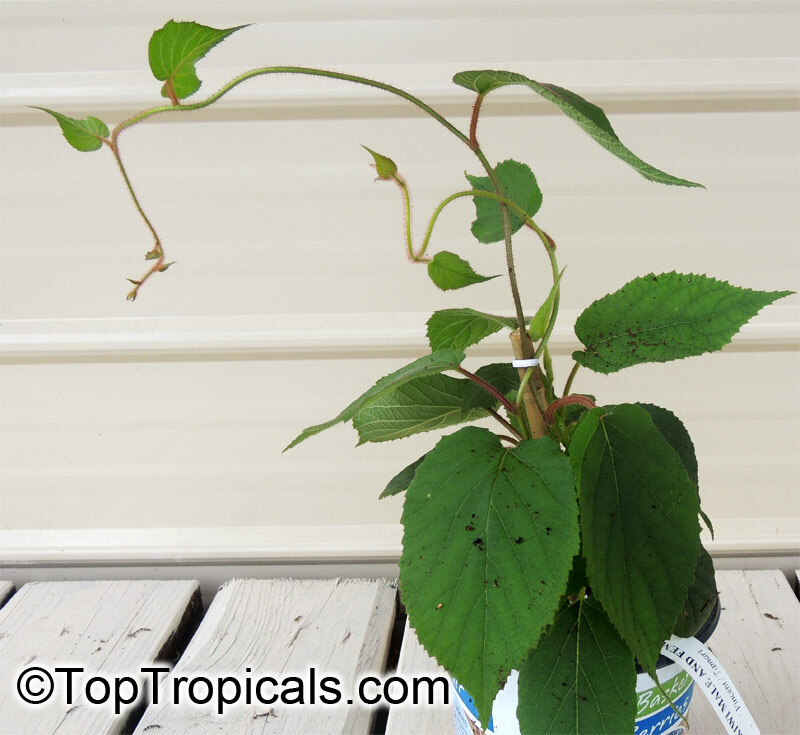 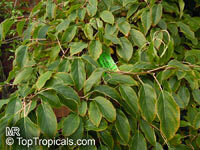 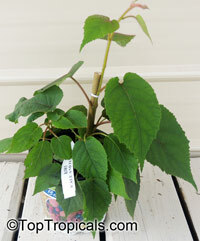 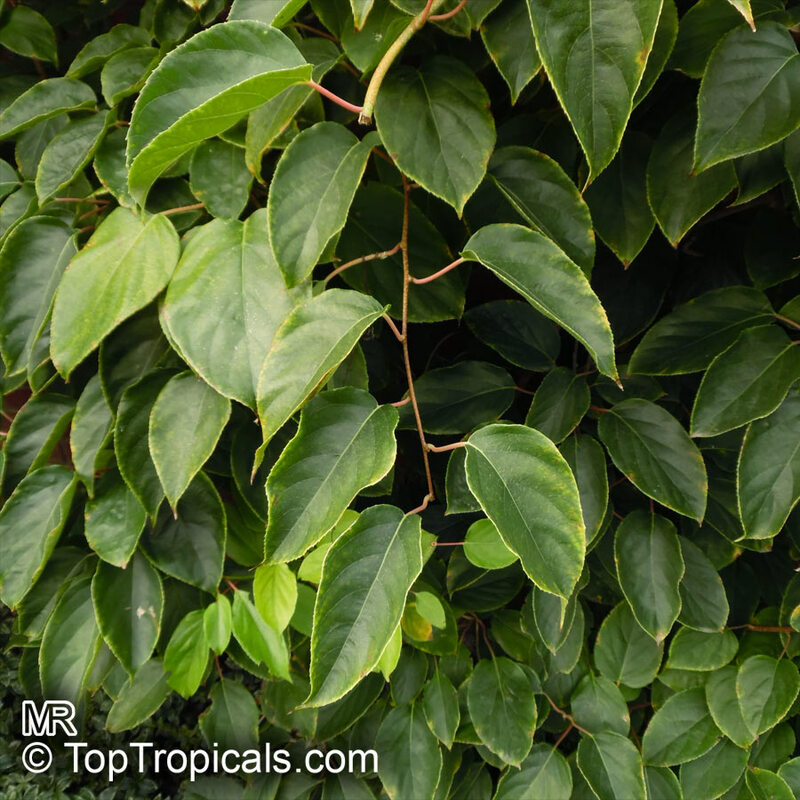 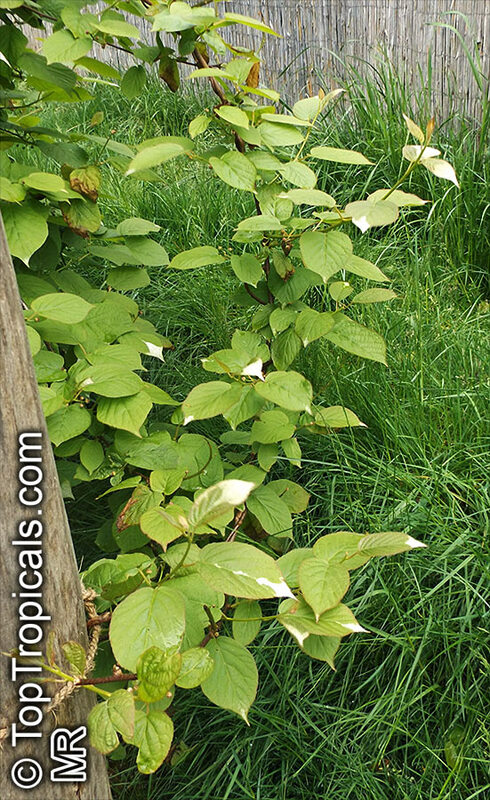 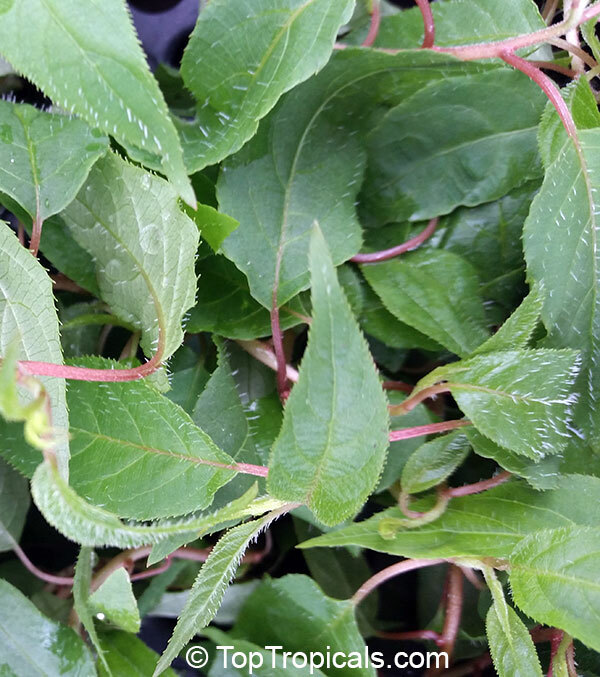 This lovely twiner with its fuzzy leaves, is ideal for trellis growing. 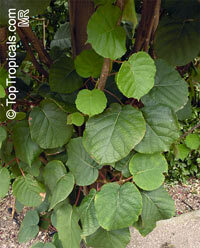 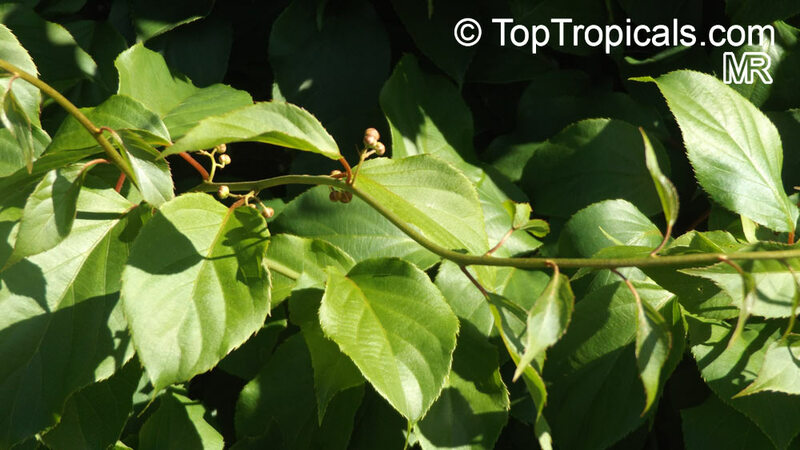 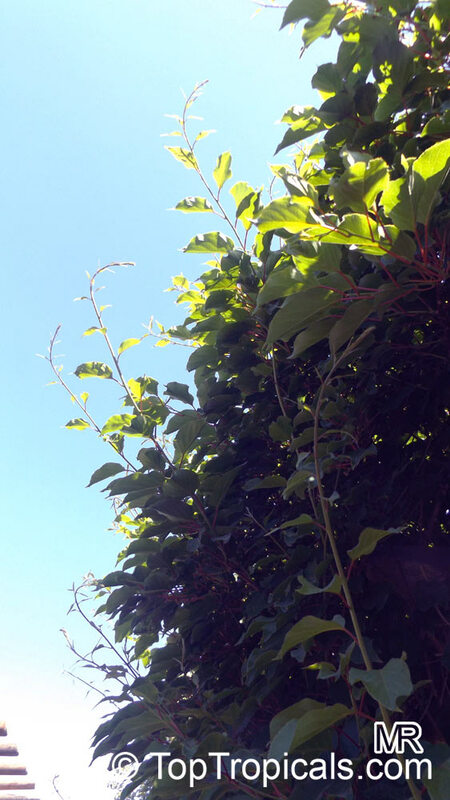 The plant is a vigorous, woody vine (liana) or climbing shrub. 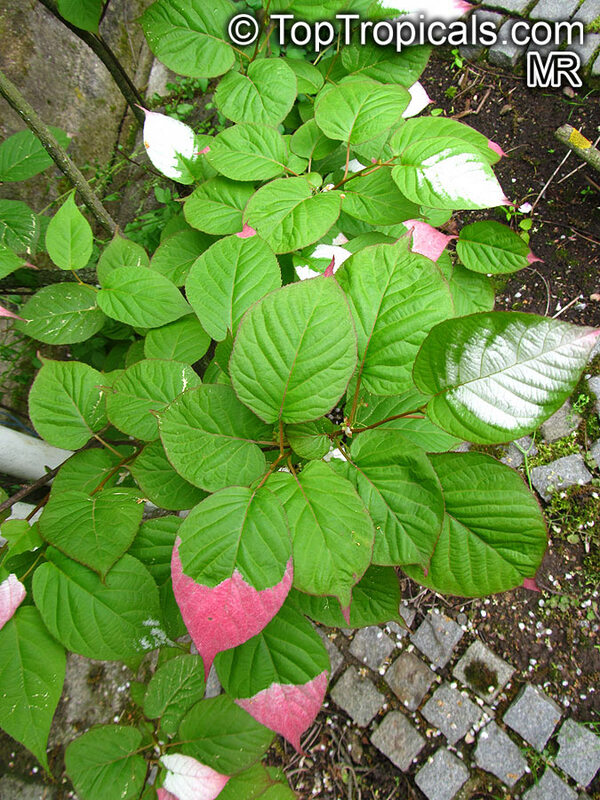 Young leaves are coated with red hairs; mature leaves are dark-green and hairless on the upper surface, downy-white with prominent, light-colored veins beneath. 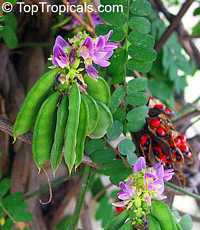 The flowers are fragrant, dioecious or bisexual. 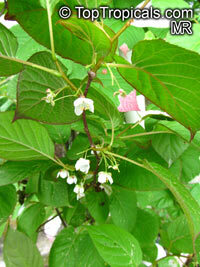 Male and female flowers appear on different plants and both sexes have to be planted in close proximity for fruit set. 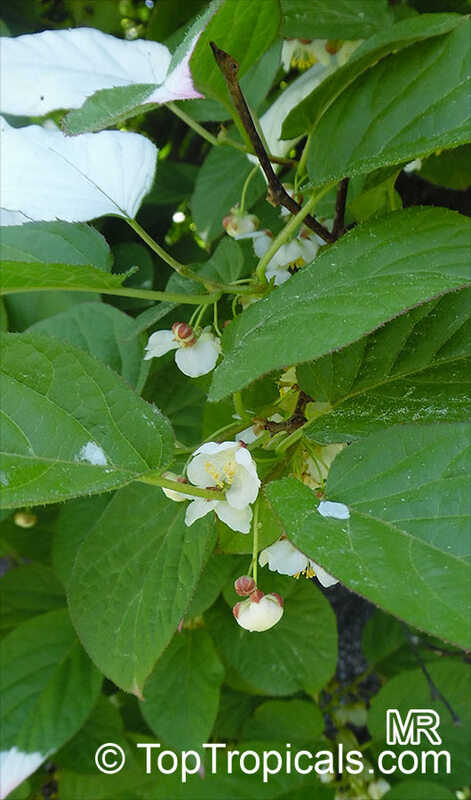 Bees are normally used by commercial orchards, although the more labor intensive hand pollination is sometimes employed. 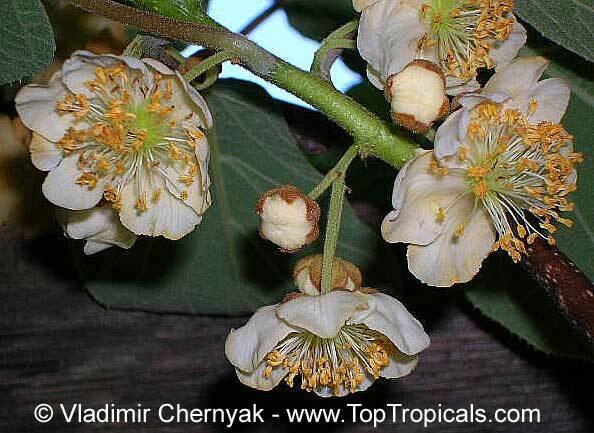 Male flowers are gathered and processed to extract their pollen. This is then sprayed back on to the female flowers. 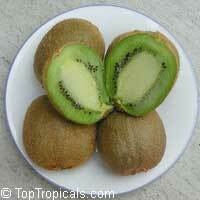 Chinese Gooseberry, Kiwi Fruit. This hardy twiner with its fuzzy leaves is ideal for trellis growing. 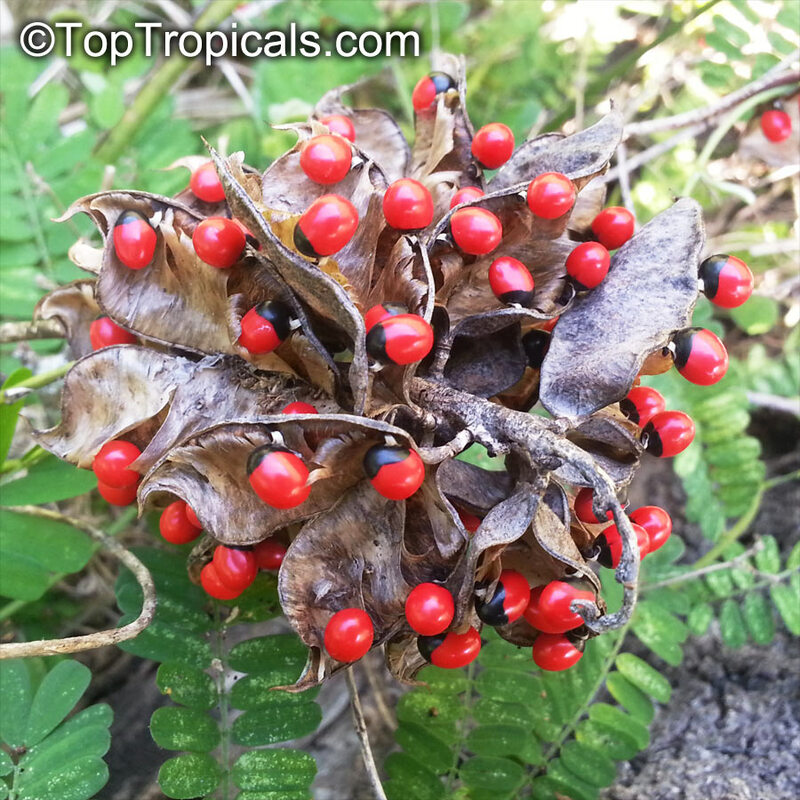 The varieties specially selected for subtropical/tropical climate, can tolerate summer heat low chill in winter. 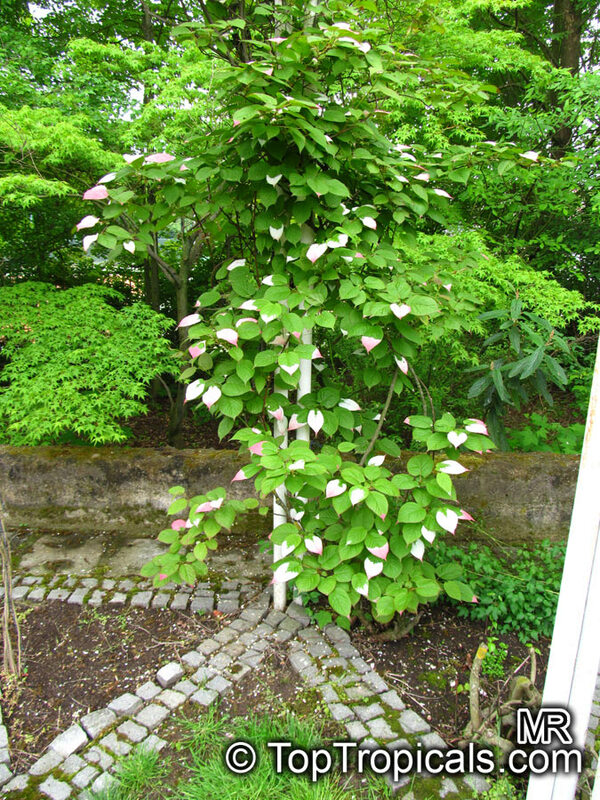 Needs only 100 chill hours below 40F. 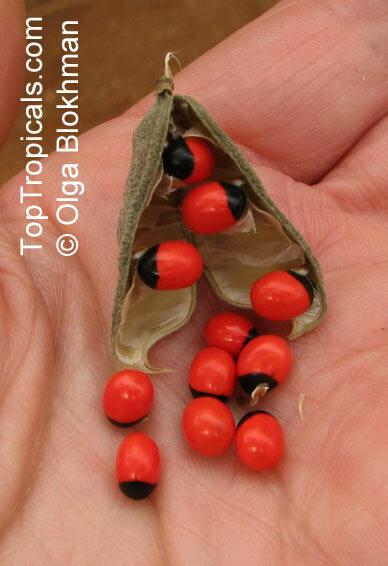 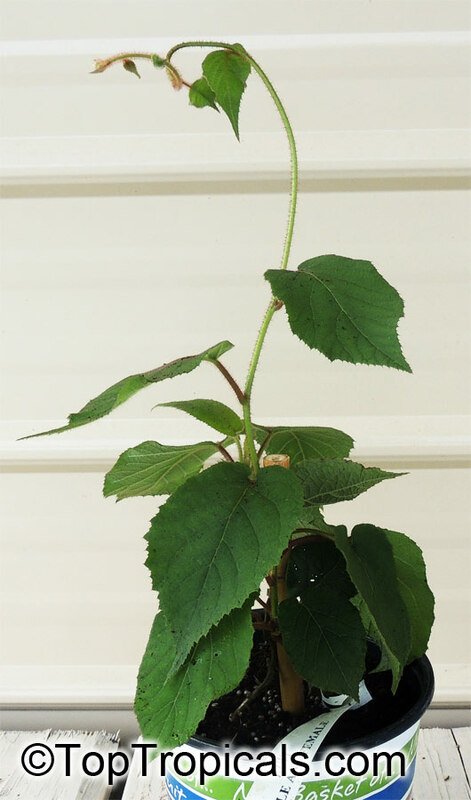 The plant is dioecious (separate male and female plants), so both male and female plants must be grown in order for proper pollination and fruiting to occur. 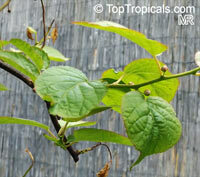 This item contains 2 separate plants - male (Tomuni/Tourmi) and female (Vincent). 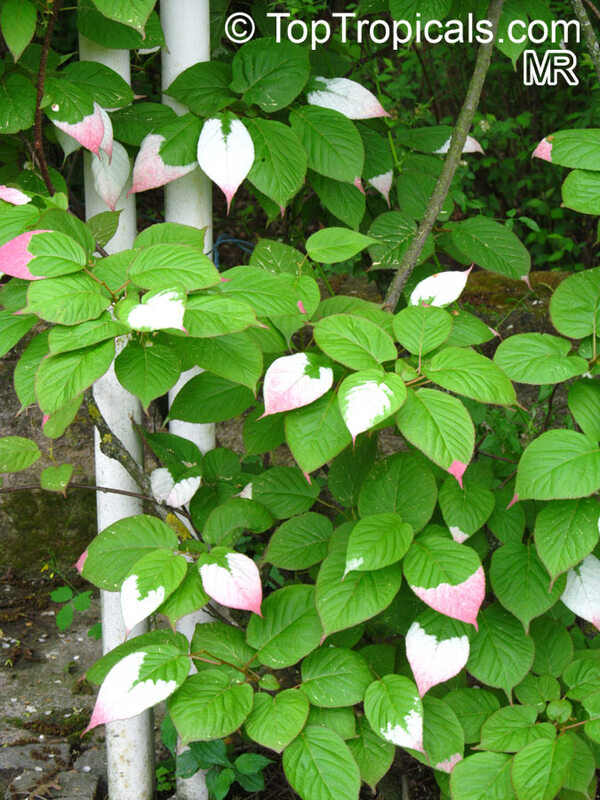 This plant has no leaves during fall-winter. Kiwi Fruit. 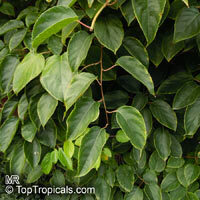 This lovely twiner with its fuzzy leaves, is ideal for trellis growing. 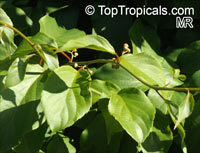 The plant is a vigorous, woody vine (liana) or climbing shrub. The flowers are fragrant, dioecious or bisexual. Male and female flowers appear on different plants and both sexes have to be planted in close proximity for fruit set. 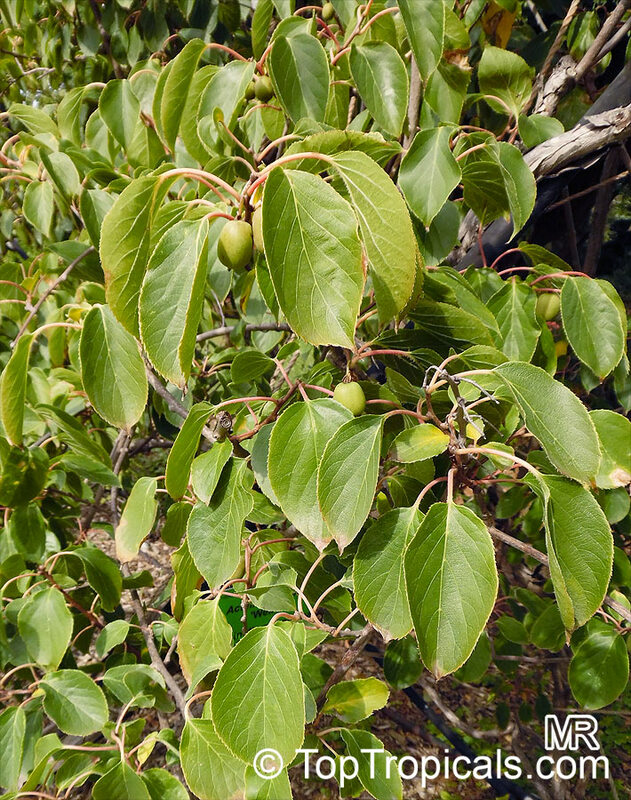 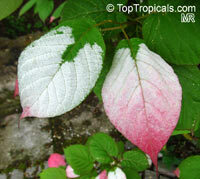 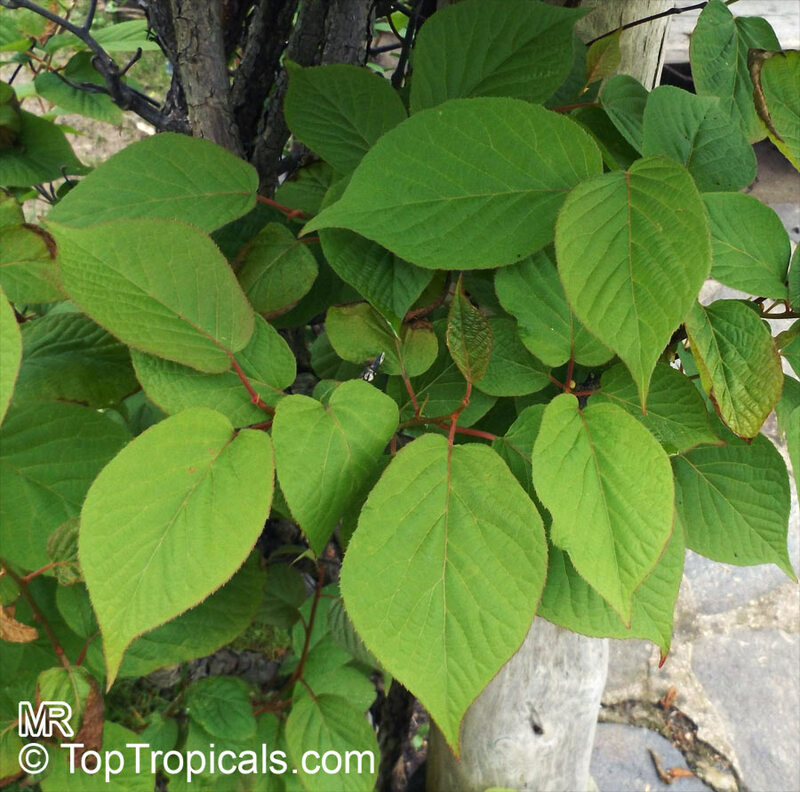 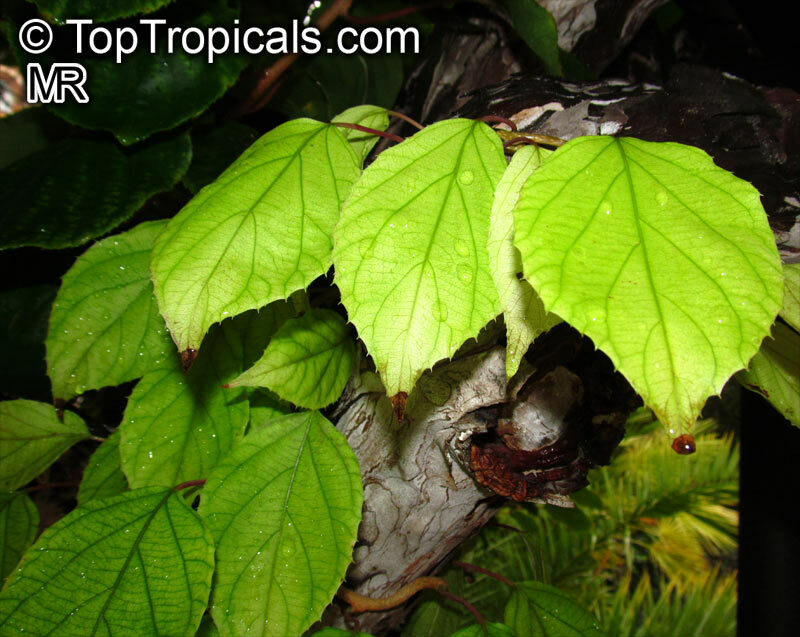 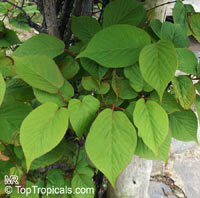 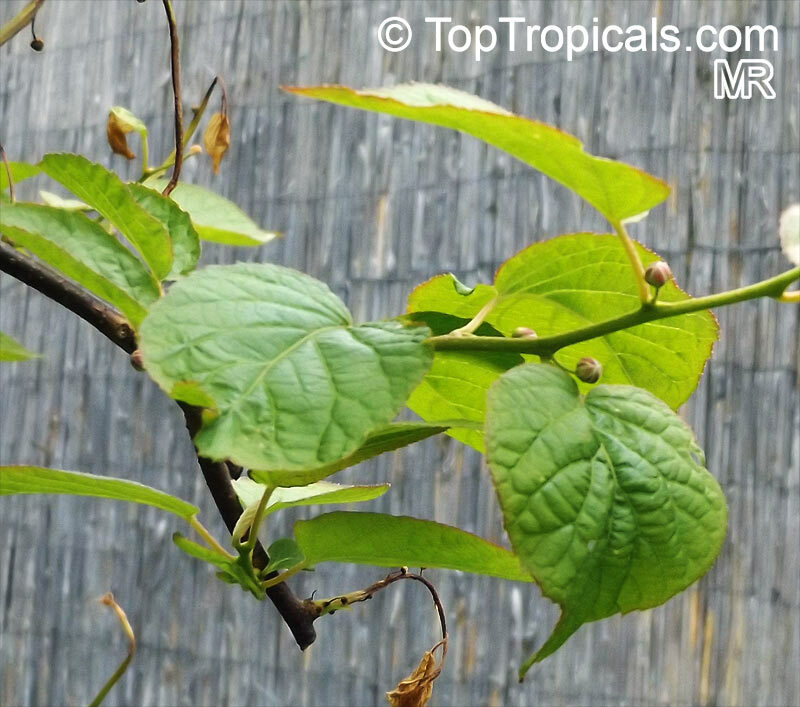 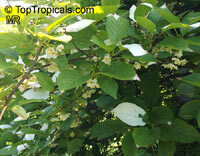 Actinidia kolomikta is an ornamental plant for gardens and a houseplant. 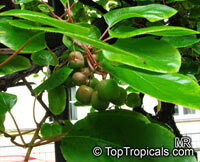 This species needs both a male and female plant to produce its sweet, grape-sized fruit. 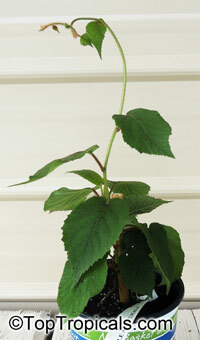 The plant is attractive to cats, which find it more attractive than catnip or valerian and can severely damage the vine.